Most of the information provided on this page is based on data taken from the National Practitioner Data Bank website. Each of the following graphs provide medical malpractice data for all health care professionals as well as for physicians (MDs and DOs) only. Claims against all health care professionals include claims against physicians, nurses, nurse practitioners, psychologists, social workers, counselors, optometrists, dentists, dental hygienists, pharmacists, pharmacy techs, podiatrists, physical and occupational therapists and speech therapists. 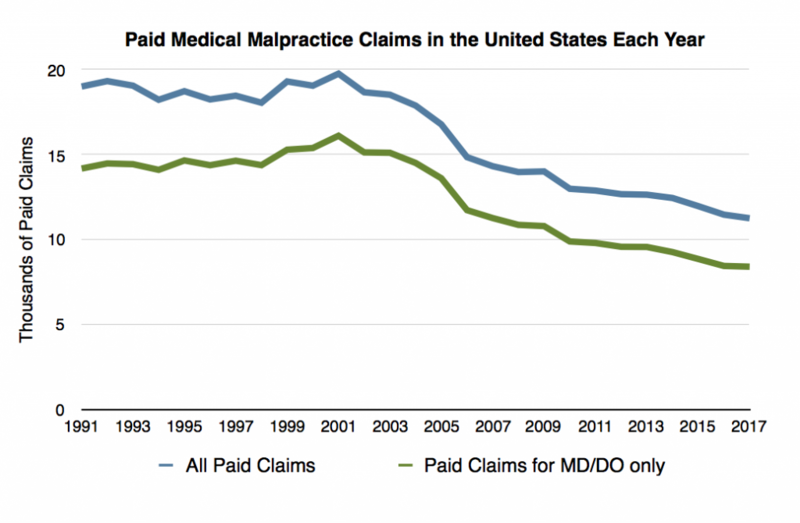 Since 2001 there has been an unquestionable drop in the total number of paid medical malpractice claims against health care professionals including physicians in the U.S. The amount spent on these claims has dropped significantly as well. The first two graphs show this trend. 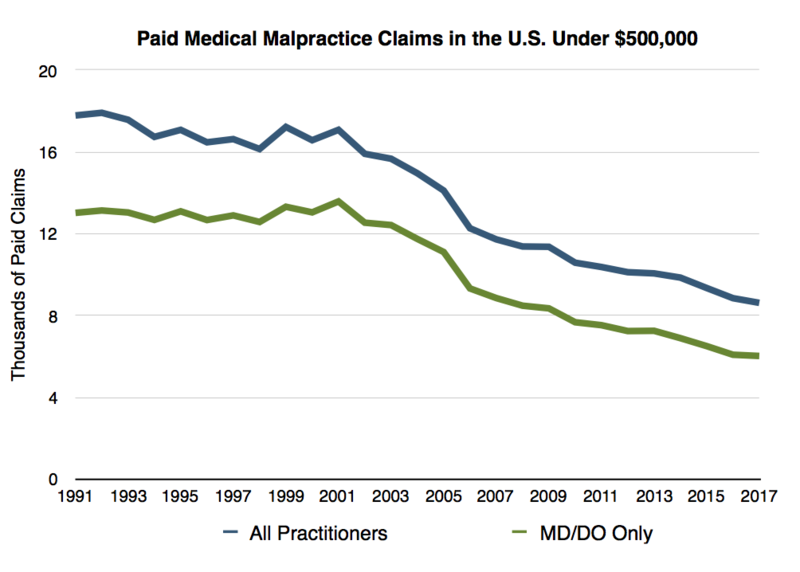 For example, there were just over 16,000 paid medical malpractice claims against MDs and DOs in 2001 in the U.S. By 2016 that number had dropped to below 8500 which is nearly a 50% drop in 16 years. The amount paid on these claims dropped by about 23% during that time. 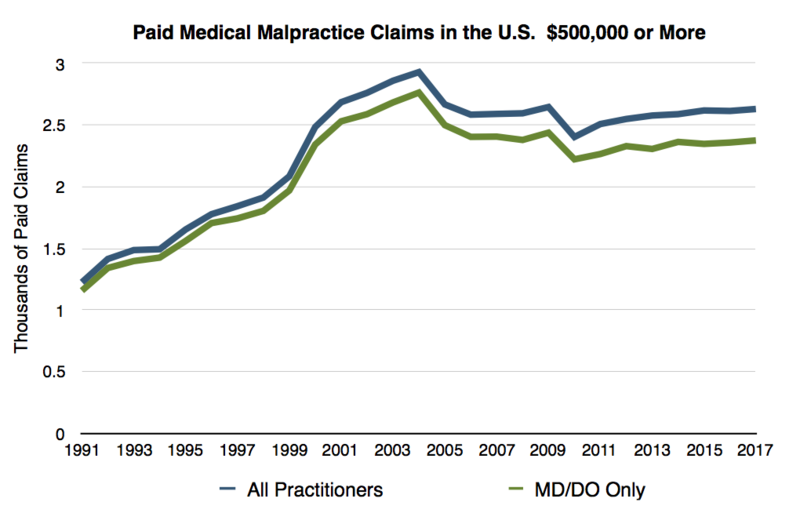 Figure 1: Total number of paid medical malpractice claims for the United States from 1991-2017 for all healthcare practitioners combined as well as for MD/DOs only. 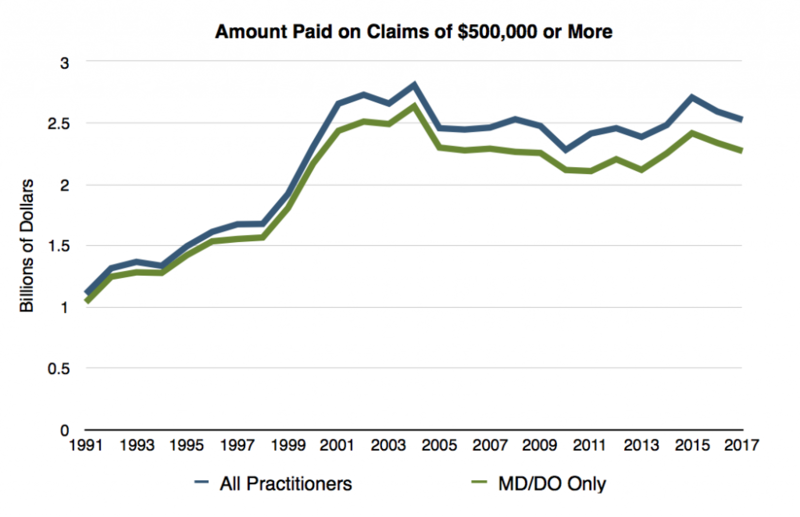 Figure 2: Total amount paid for all medical malpractice claims from 1991-2017 for all healthcare practitioners and MD/DOs only in the United States. The third graph shows that, when adjusted for inflation, the cost of medical malpractice in the U.S. has dropped even further. Figure 3: Figure 2 data when adjusted for inflation. 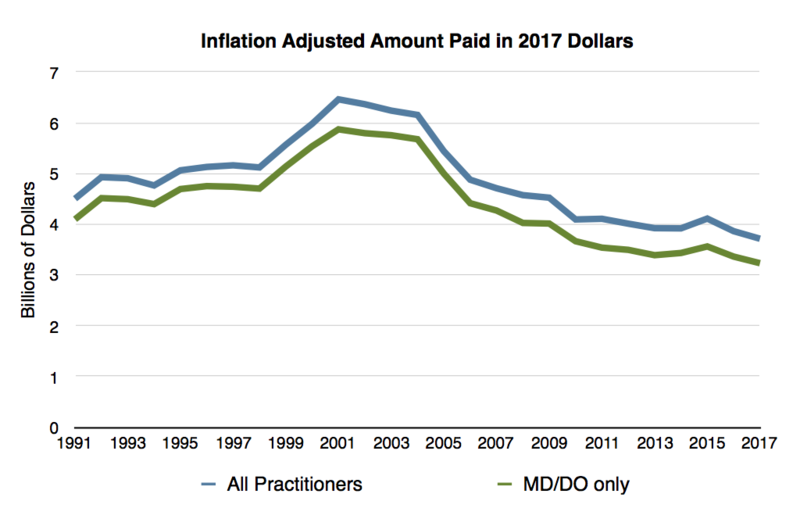 The next two graphs show that most of the drop in paid medical malpractice claims have been in those that resulted in smaller payouts (less than $500,000) which, for physicians, have dropped nearly 55% since 2001. 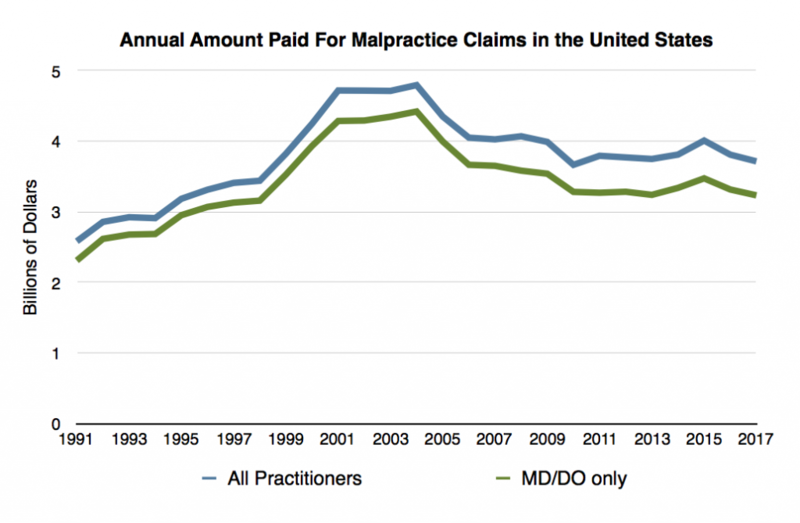 Figure 4: number of paid medical malpractice claims Each Year in the U.S. that were Settled for Less than $500,000. The number of large claims ($500,000 or more) against health care providers has been far more constant over that same period of time. Figure 5: Number of paid medical malpractice claims in the U.S. each year that were settled for $500,000 or more. The average amount paid on claims of $500,000 or more has gone up either. Figure 6 show that the total paid on these claims has also been surprisingly constant since 2001. This means that, even though the sky is the limit on how much an individual claim might pay in most states, the average amount paid on those claims hasn’t budged much. Also note that figure 6 is not adjusted for inflation. Figure 6: The annual amount paid on all paid medical malpractice claims in the U.S. that were settled for $500,000 or more. Even though the cost of medical malpractice has dropped precipitously in the U.S. as a whole since 2001, malpractice costs still vary extensively from State to State. 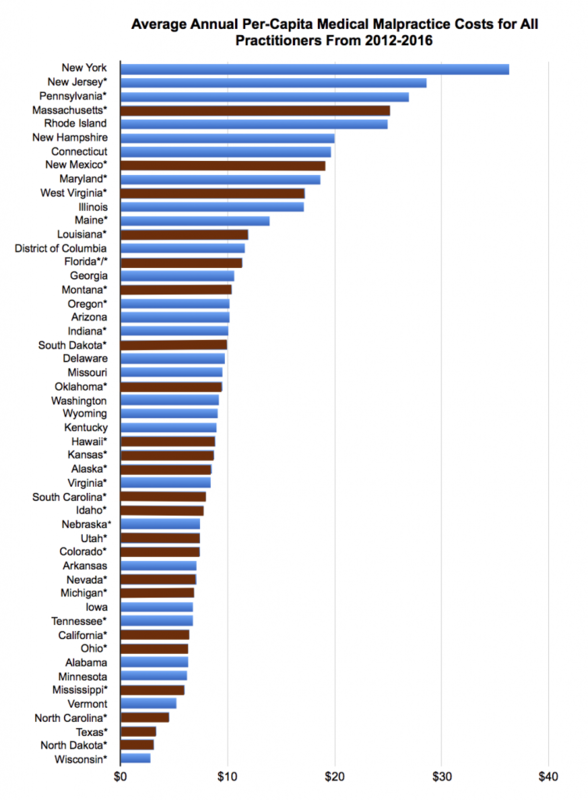 The following two graphs show the difference in per-capita medical malpractice costs (Figure 7) and paid claims (figure 8) for each state from 2012-2016. 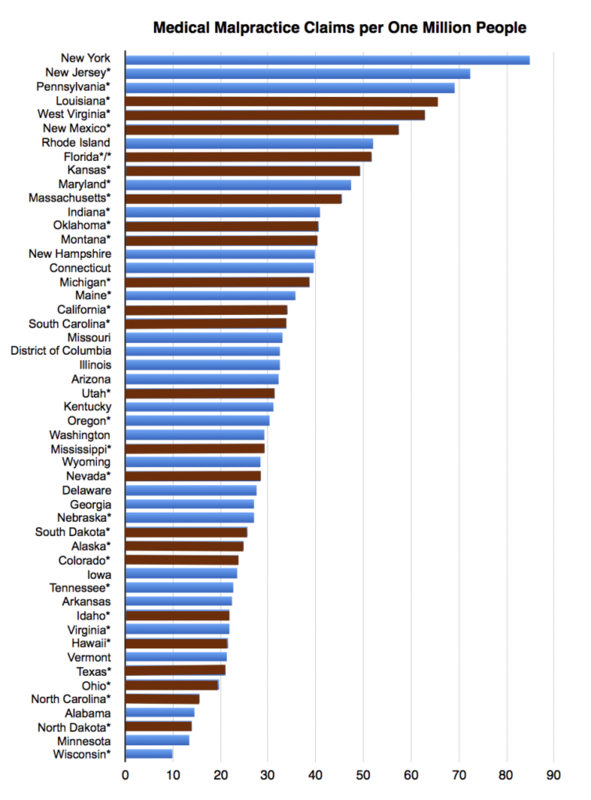 You’ll notice that New York tops the list on both graphs. In fact, since 2003, the state of New York has consistently accounted for nearly 20% of all medical malpractice costs in the U.S. Figure 7: The average amount paid on all medical malpractice claims for each state from 2012-2016 divided by the state’s population for each of those years. For example, an average of about $36 was paid in medical malpractice claims each year for each person living in New York from 2012-2016 whereas only an average of about $3 was paid each year for people living in Wisconsin those years. * indicates that the state has some sort of tort reform law aimed at reducing either medical malpractice costs or the total number of claims in that state. A red bar indicates a rather robust tort reform law that either caps non-economic damages at $500,000 or less or total damages to $1 million or less. Figure 8: The average number of paid medical malpractice claims per one million residents in each state from 2012-2016. In New York, there was an average of about 85 paid malpractice claims per million residents whereas in Wisconsin there were only about ten paid claims each year per million residents from 2012-2016. The drop in the number of paid malpractice claims against health care workers hasn’t been even across all states either. Some states (e.g. Texas) have seen a dramatic drop in both the number of paid medical malpractice claims and the total amount paid in medical malpractice. Other states (e.g. Louisiana) have seen very little change in either the number of paid claims or the amount paid. Even so, very few states saw either an increased number of paid claims or an increase in total medical malpractice cost since 2003. This further demonstrates the fact that medical malpractice does not appear to be a contributing factor to rising health care costs anywhere in the US. Below are reports on the trends in medical malpractice for each individual state. 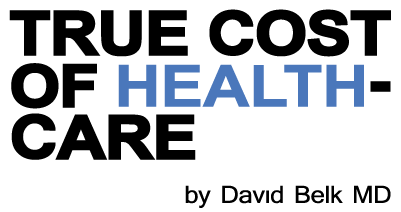 Included in each report is a description of any tort reform law the state has aimed at controlling medical malpractice costs and whether the law appears to have had much of an effect on these costs. A three page PDF report is linked to the name of each state and a csv table containing the raw data is linked next to it. © 2012-2018 TRUE COST OF HEALTH CARE. ALL RIGHTS RESERVED.